In a past column, I’ve mentioned memp_trickle as a way to get beyond the double I/O problem. And it often works well for this, but there are times when it doesn’t. Trickle is a sort of optimization that I would call speculative. These sorts of optimizations attempt to predict the future. We do work now, in a separate thread, because in the future the fruits of our work will be useful. In trickle’s case, we do writes from the cache now, in a separate thread, because in the future clean cache pages will eliminate one of our I/Os in the main thread, decreasing latency. But gazing into the crystal ball of the future can give a hazy picture. One obvious case is that we might not benefit from the clean cache page, ever. Our program may simply stop, or have no more database requests. Generally we’re not particularly worried about that — BDB systems typically run forever, we’ll eventually get more traffic, updates, orders, etc. Our second hazy case is that we may not need more clean cache pages. If our entire working set of accessed pages fits into the BDB cache, then we’ll be accessing the same pages over and over. No new pages needed. Trickle done on this sort of system will create extra I/O traffic. Consider a single leaf page in this scenario. It’s updated, perhaps once a second, but never written to disk, at least not until a checkpoint. Every update, we get for free, as far as I/O goes. Another way to look at these free updates is that the update per write ratio is way up. Add in a trickle thread, and it may be written more often (update per write goes down). That’s unneeded I/O. Unneeded I/O yes, but this may not be a big problem. Remember in this scenario our entire working set fits into the BDB cache. Our main thread is not doing any I/O anyway. While trickle adds more I/O, but nobody is waiting on those spinning disks. If we were paying attention to our BDB stats, we’d see that we didn’t have a double I/O problem to begin with. There’s another hazy case that’s a little more subtle. Even though our data accesses may not be entirely in cache, and we do see double I/Os, we may see trickle be counter-productive. This can happen if we’ve totally saturated our I/O. The extra burden of trickle adds to the I/O queue, and any I/O request will take longer. Trickle may still be helpful if our cache hit rate is low enough that we don’t have many free updates and we’ll really need a high proportion of pages that trickle creates. Trickle’s bread and butter scenario is when there is a mix of get and put traffic (get benefits the most from trickles effects, puts are needed to create dirty pages that give trickle something to do), when I/O is not overwhelmed, when the system is not entirely in cache. On the butter side down, we see trickle not performing when we don’t have some of those conditions satisfied. There’s lots of in between when it’s not so clear, you just have to try it, fiddle with the frequency and percentage, and see. I’ll have more to say about other sorts of speculative optimizations in later posts. For now, let’s just say that like other forms of speculation, this one has no guarantees. There is never any substitute for testing on your own system. If you have a ‘readonly’ Btree database in BDB, you might benefit by this small trick that has multiple benefits. The trick is to reload the database. You’ll get a compact file with blocks appearing in order. Perhaps you’re using BDB as a cached front end to your slower SQL database, and you dump an important view and import it into BDB. Maybe you’ve written a custom importer program. You’ve got this down to a process, that runs, say, hourly. Here’s the thing – if you happened to import the data in the same order that it will appear in BDB (i.e. the key is sorted ascending) you’ll get some great optimizations. When a page is filled up and is being split, and BDB recognizes that the new item is at the end of the tree, then the new item is placed on its own page. That means that data inserted in order will ‘leave behind’ leaf pages that are almost completely filled. BDB also recognizes the opposite case, when a key is inserted at the beginning of the database, and makes the uneven split in the other direction. Here are the benefits to such a compaction. More key/data pairs per page means fewer pages. Your cache is more effective since you can squeeze more key/data pairs into memory at a time. Viewed from another angle, less of your BDB cache is effectively wasted space. (Nobody wants to say it this way but a fill factor of 72% is 28% wasted space). More keys on a page means fewer internal pages in the level above. There is a cascading effect – the btree may be shallower in a compact database than one uncompacted. Fewer levels means faster access. One more benefit to reloading is that pages will be allocated in the underlying file in order. Sequential (cursor) scans through the database are going to appear as accesses to sequential file pages. If the OS performs readahead, your IO will be already done when you advance to the next block. Your OS may not have readahead, but your file system may try to group sequential disk blocks closely on the physical disk. If the disk’s cache can accommodate it, sequential read requests may be satisfied in advance there. The takeaway is that even if BDB’s cache is not large enough to hold your nicely ordered file, you will probably get better read performance during cursor scans due to an optimization or cache at some other level. If you’ve inserted all your key/data pairs in key-order then you’ve already getting these great benefits. But if you were unable to that, here’s the quick and easy way to get there. Remember, we’re talking about a readonly database, so the right time to do this is right after creating the db file and before your application opens it. That’s it. I’ve written this in UNIX shell-ese, but it works similarly on other systems. One could easily write a C/C++/Java/C#/etc. function to do this for embedded installations. And speaking of a function to do this, there is already the DB->compact function, which can be used on a running system to get many of the same effects we were touting for compacted data. DB->compact won’t try to optimize the page ordering. But that’s okay, it’s really solving a harder problem since it can be used on databases that are not readonly. If your database is not strictly readonly, there’s a slight downside to a fully compacted database. Since all the pages are filled to the brim with key/data pairs, a new entry, any new entry, will split a page. You’re pretty much guaranteed that your first put and some subsequent ones will be more expensive. There’s a cost to splitting pages that needs to be weighed against the benefits you’ll get. Fortunately, DB->compact has an input fill factor; with an access pattern with higher proportion of scattered writes, you may want to lower the fill factor. There you have it. Two lines of shell code, and gobs of verbiage to beat it to death. Good thing I don’t get paid by lines of code. I saw Temple Grandin speak recently and I heard a number of nuggets of wisdom from someone who truly thinks different. If you don’t know the name, Dr. Grandin is a very high functioning autistic person who has revolutionized the livestock industry by understanding at a sensory level what cattle are feeling and how that influences behavior. The remarkable thing is that her autism gave her a new viewpoint that has been valuable for her and the industry. One of her points was that many of us are top-down thinkers. We approach problems from the top, breaking it down bit by bit. Why is my program slow? Is it the framework? The data store? The network? Obviously, this sort of analysis is important and usually the right way to start (let’s select a great algorithm before implementing, please). But when you’re not making progress at the tuning side of things and need another angle, it can be helpful at looking at things from the other end. Temple is a sensory person. The five senses affect her directly. She has no choice but to start with these details and process bottom up. In our domain, that would be starting with the data. The raw bits. So if you are trying to improve database performance, it can often be helpful to move beyond the code and look right at what data you are storing. In Berkeley DB, you can do this using db_dump. db_dump is typically used to dump and restore databases, but why not use it as a raw visualization tool? In the sample above (inspired by, but not copied from, real customer data), the first line with numbers: 09174000 is a key, followed by the data. Then another key, data, etc. I’ve shown just a couple key/data pairs just to get the creative juices flowing — you’ll probably want to pipe your db_dump through your favorite pager and let a lot of entries fill up your screen. Once you start immersing yourself in the actual data you’ll probably get lots of ideas. When I see data like in the sample above, I have to ask why there are all those zeroes in the same place for each data entry. Is there a way to condense or compress the data? Why is this relevant? Because if you can get your data smaller, one of the nicest effects is in cache efficiency – with data that’s half its original size you’ll be able to fit twice as many entries in your currently sized cache. Another possible effect is reducing the number of overflow pages, which can have multiple good effects. (I’ll have to get into that in another post). You might also sniff out some other peculiarities. Hmmm, the keys all appear to have zeros at the end, rather than leading zeros. And they aren’t correctly sorted. Did we forget to ensure the most significant byte goes first? That sort of error can cost a lot in the locality of accesses, which can again lead to caching inefficiencies. Obviously, your data is going to look different, and you’re going to notice different things. But you’ll never notice unless you look. Get down to the details – smell it, taste it. And then fix it. Here’s an interesting set of posts from Shaneal Manek, the developer behind signpost.com (born as postabon.com). He first makes the point that LISP is a fast language for internet server development, and with some small optimization hints, can be 4x faster than Java, and 15x faster than Python. I think that qualifies him as a free thinker. For most projects, I’ve long been a proponent of choosing a language based on how quickly and accurately developers can get their work done and not so much on the basis of how fast the language is. Yeah, think about rewriting for speed in another language is a fine thing to think about in version 3 or 4 well after you have something that works and delivers the goods. While someone in a lower level language is still debugging their intermittent crashes (the long tail of development), you’ll have time to both refine your feature set and tweak the parts of the application that are the slowest. Which brings us to post number two. He argues that if you’re going to think about optimizing and scaling, think about the huge chunk of time your application is waiting for databases or disks. Because of the huge disparity in CPU and disk speed, many applications are disk or I/O bound. If rewriting their application in C makes your code run twice as fast, it may only buy you an absolute performance boost of 10%. On the other hand, if you could make your database go twice as fast, it might buy you a net 30% performance boost – which is huge (and still far easier to do than rewriting your app in C). He makes his case with supporting benchmarks. Yes, your mileage will vary. What is the proportion of time your app spends in database calls? Out of that, for the heaviest used table (or even single query), what is the proportion of time spent waiting on that? What would it take to rewrite just that table or single query access with a No-SQL solution? One of the user comments to Shaneal’s post says the comparison given is apples to oranges: MySQL is network based, and BDB is an in-process solution. 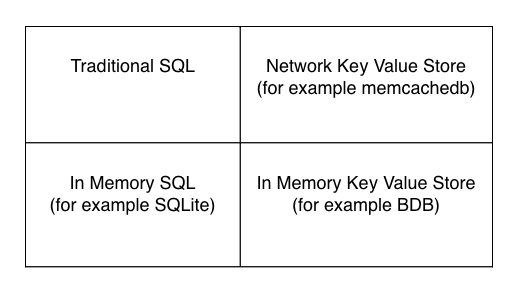 He suggests comparing MySQL with a network based key-value pair database. The point is a good one, you don’t really know if the impressive speedups were due to BDB being a key-value vs. SQL, or whether it was due to the speed of having everything work within the same process. I suspect the reason is some of both. If you’re in the upper left corner, you can fully explore the matrix by trying the lower left first: SQLite (the BDB distribution now includes a version of SQLite that is backed by BDB). For the upper right, you could try a network key value store, like memcachedb. Core BDB belongs in the lower right category. In any event I think the main point is clear. When looking for a speedup, understand what is taking time and figure out what the alternatives will buy you. Beware these words — “I see this is taking a good chunk of our time, but unfortunately we can’t do anything about that”. Because sometimes you can. Berkeley DB, at least the core API, is mostly threadless. If you are using any of the APIs that have been around for more than five years, there’ll be nothing happening, threadwise, in the background. I think a lot of folks miss this point. You can certainly use multiple threads with BDB. Just turn on that DB_THREAD flag and all your handles are free threaded. But does this imply that BDB is also firing off background threads? No indeed. An example. Let’s talk about the cache again – one of my favorite topics! The cache may seem a little magical, but in fact its actions are synchronous with what is happening in your API calls. If the operation you are doing needs to get a page from a DB file, then the cache is involved (you can’t bypass the cache). If the page isn’t in cache, then the least recently used page in the cache is evicted. If that page is dirty, then it is written to the backing file. Ouch. Only when that completes is the cache page freed up so that the page you need now is read into the cache. Double ouch. That all happens when you do a DB→get. Yup, it might be up to two I/O calls, just for a single page access. If your fetch gets multiple pages, as it would in a BTree, you’re potentially doing more I/O. And to the point of this article, none of this happens in the background. Finally, when the API call returns, no trailing operations, like async writes, happen in the background. Now that might sound grim for a high performance embedded data store, but we’re talking about potential I/O, we can get rid of a lot of that. First, you’ve sized your cache right, right? So the vast majority of accesses to get pages are going to be found in the cache. And when navigating a Btree, certain pages like the internal pages are going to be hit a lot. It all depends on your access pattern and cache size of course, but these internal pages tend to be highly used, and rarely evicted. So this mostly gets rid of one ouch. offloads a large percentage of those I/Os from a synchronous DB→get call to a background activity. Goodbye double ouch. A philosophy. This all is in keeping with the core BDB philosophy of keeping the programmer in control. You can control every aspect of the trickle activity: whether to do it, what percentage to clean, how often to run, even what threading library you want to use. In fact, trickle can happen in its own process, rather than a separate thread. Other core features, like checkpointing and deadlock detection  are likewise ‘synchronous’ method calls that are often run as background threads or processes. Calling these APIs doesn’t imply any threads being spun off. Moving beyond the core API, more and more threads pop up. For starters, the replication manager API (not the replication base) does use threads to manage replication activities. And there’s definitely knowledge of threads in the Java API (see TransactionRunner) and Core DB (see failchk). Berkeley DB Java Edition (JE) is a cool pure java version of Berkeley DB. Its philosophy is quite a bit different, and a lot of the basic housekeeping like eviction and cleaning happen in background threads by default. You still have lots of control over configuration. Finally, there’s this thing called SQLite that comes as part of BDB nowadays. It’s the popular full blown embedded SQL engine built integrated with a BDB backend. Talk about a change in philosophy. I’ll be blogging about that in the future once I have a chance to put it through its paces. Background threads in that? I don’t see them. BDB has come a long way. But if you’re doing work with the good ol’ core API, and even with some of the new stuff, you have to keep this threadless model in mind. Just remember to spin off your own trickle thread so you can dial up the performance. Deadlock detection also may be handled synchronously with almost no penalty, that’s a story for another day.